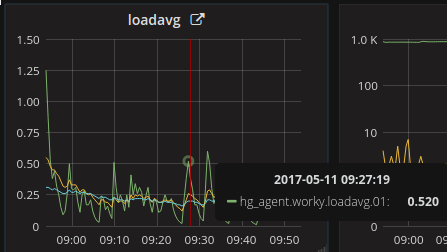 This document describes the base system metrics exported by the Hosted Graphite agent. We focus on the default “base” dashboard, and also provide notes on related metrics not displayed there. We list metric unit - percentage, count, bytes, etc. - in brackets after each metric description. If you find anything unclear or incorrect here, please let us know! and represent percentages of time each cpuid spends in particular states. system: processes executing in kernel mode (percentage). guest_nice: running a niced virtual guest (percentage). 15: 15-minute load average (count). 15_normalized: 15-minute load average normalized by #cores (count). These are simple “snapshot” counters of the process numbers. Note that the number running will typically be maxed out at #cores. 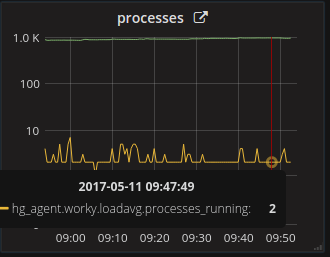 processes_running: number of processes running (count). Cached: in-memory cache for files read from the disk, i.e. the pagecache (bytes). SwapFree: amount of swap space available for use (bytes). There are several other metrics available under memory.*. If you’re digging further, you can find out what they mean in the docs for /proc/meminfo. 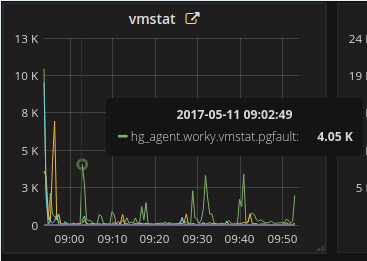 These are metrics from /proc/vmstat and give some insight into the activity of the Linux virtual memory system. Unfortunately, the counters are a little underdocumented. pgpgout: pages written out to disk (count). Note that because everything goes through the page cache, these are recorded for essentially all pages read from or written to disk, so if you’re doing a lot of IO they’ll be elevated. Next, swap usage which generally you want to keep low or nonexistent. See this article for more information. pswpout: pages swapped out into swap space (count). pgmajfault: major page faults (count). Note that page faults will stimulate paging in, so you can expect these to correlate. Dirty: memory waiting to be written back to disk (bytes). 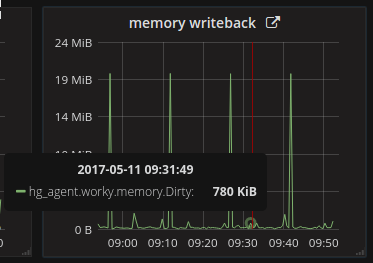 When you change disk-backed memory in the page cache, it’s not written to disk immediately, just marked as “dirty”. This graph allows you to see how much is building up & being written back over time. These metrics are per-disk, and are gathered from /proc/diskstats. util_percentage: how much of the time the disk is performing I/O operations (percentage). There are many other iostat metrics exported per disk; you can browse your metric tree to see which and compare with /proc/diskstats and the ‘diskusage’ diamond collector. 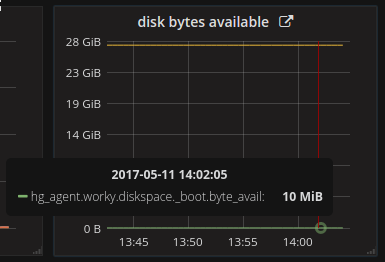 Again, these metrics are per-disk. byte_avail: available bytes, i.e. space available for use by non-privileged users (bytes). tx_drop, rx_drop: packets dropped by the driver on transmit, receive (count). There are many other network metrics exported per interface; you can browse your metric tree to see which and compare with /proc/net/dev, which is fairly self-explanatory, and the ‘network’ diamond collector. They’re drawn from /proc/net/sockstat, which is under-documented. 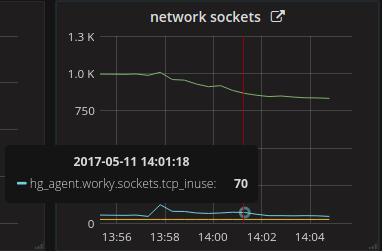 udp_inuse: UDP sockets currently in use (count). tcp_tw: sockets in TIME_WAIT, i.e. waiting after close to handle packets still in the network (count).